YOKOTA AIR BASE (AFP) - President Donald Trump on Sunday (Nov 5) warned that “no dictator” should underestimate the United States, in a thinly veiled reference to North Korea, which is likely to dominate his Asian tour. 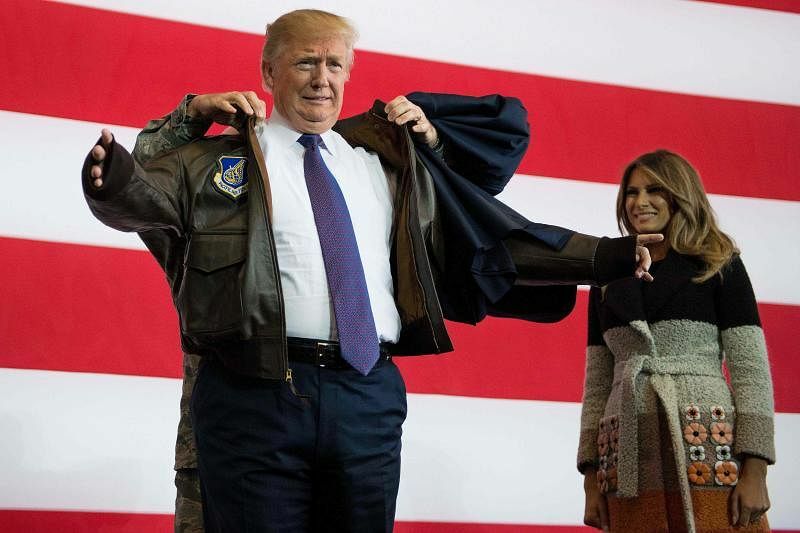 Speaking to cheering servicemen at Yokota Air Base just west of Tokyo, Trump donned a military jacket offered to him and issued a threat that “no one, no dictator, no regime and no nation should underestimate... American resolve”. “Every once in a while in the past, they underestimated us. It was not pleasant for them, was it?” roared Trump. Trump’s marathon trip comes with the North Korea crisis at fever pitch, with US bombers running sorties over the Korean peninsula and fears mounting of another Pyongyang missile test. The president’s first stops are Japan and South Korea – frontline US allies in the effort to force Pyongyang to abandon its nuclear programme, and the two countries with most to fear should a full-scale conflict break out. Trump touched down under clear blue Tokyo skies and stepped out with his wife Melania in bright sunshine to greet the crowds. Speaking to reporters on the plane, he announced he would likely be meeting Russian President Vladimir Putin during the tour, as the international community battles for a solution to the North Korean missile crisis. “I think it’s expected we’ll meet with Putin, yeah. We want Putin’s help on North Korea, and we’ll be meeting with a lot of different leaders,” said Trump. He added that North Korea was a “big problem for our country and for the world, and we want to get it solved” but had kind words for the people in the hermit state. “I think they’re great people. They’re industrious. They’re warm, much warmer than the world really knows or understands. They’re great people. And I hope it all works out for everybody,” he said. The next stop for Trump is a golfing date with his “friend” Shinzo Abe, prime minister of Japan, which has seen missiles fired over its northern island amid threats by Pyongyang to “sink” it into the sea. 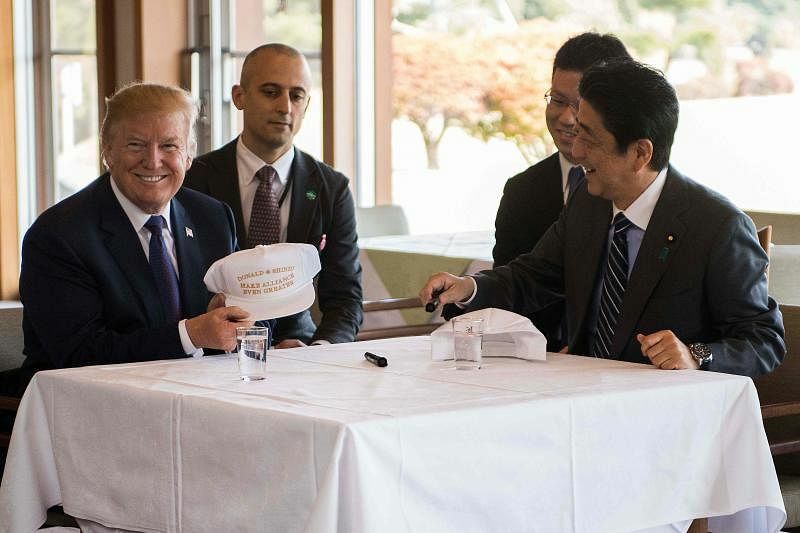 Trump and Abe enjoy a close personal relationship and the three-day Japan leg of the trip is noticeably relaxed, with the two leaders being serenaded by wacky internet sensation Pikotaro after their nine holes. The Japanese leader has emerged strengthened from a crushing victory in a snap election and has firmly supported Trump in his policy of exerting maximum pressure on Kim, backed up with the threat of military force. “I want to further cement the bond of the Japan-US alliance, based on our relations of trust and friendship with President Trump,” said Abe as Trump arrived. 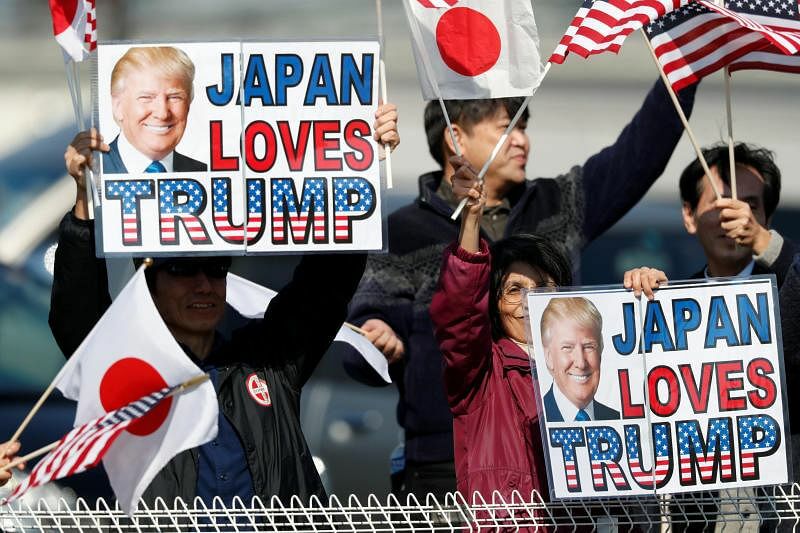 Trump for his part described Japan as a “treasured partner and crucial ally of the US”. “Trump only has to play golf in Japan, as he knows Japan will follow (the US) whatever happens. Everything has been sorted out beforehand,” Tetsuro Kato, political scientist at Tokyo’s Hitotsubashi University, told AFP. While Trump has been in regular contact with the hawkish Abe during the North Korean missile crisis, he pointedly failed to speak to South Korean President Moon Jae In for several days after Pyongyang’s second intercontinental ballistic missile test in July. Analysts point to Abe and Moon’s contrasting approaches to the crisis as an underlying factor, although both leaders will be hoping to press Trump into reaffirming Washington’s steadfast commitment to their defence. Trump labelled Moon’s approach as “appeasement” on Twitter, a comment that did not go down well in the Blue House. “The two sides have subtle differences in their positions,” said Kim Hyun Wook, a professor at the Korea National Diplomatic Academy. Trump will not follow the well-trodden path to the De-Militarised Zone dividing the Korean peninsula – a visit derided in Washington as a bit of a “cliche.” From Seoul, Trump travels to China to meet his counterpart Xi Jinping who, like Abe, has solidified his grip on power, after being handed a second term. Trump said before his trip that China could have a “big problem” with “warrior nation” Japan if the North Korea issue is not solved. He then travels to an Apec summit in Vietnam before heading to a Asean gathering of South-east Asian leaders. Some observers were fretting that a gaffe by the famously ad-lib president could send tensions rising on the peninsula. “It will be a disaster if he speaks off the cuff and without thinking,” said professor Koo Kab Woo from the University of North Korean Studies in Seoul.